Anandita Agrawal, crazylilmum says that the cuteness she tries to add in all her posts is the way she gives her content an edge over the rest. Staying as genuine as possible is how she maintains editorial objectivity. Also, she researches and pens down things which would be helpful for her readers. 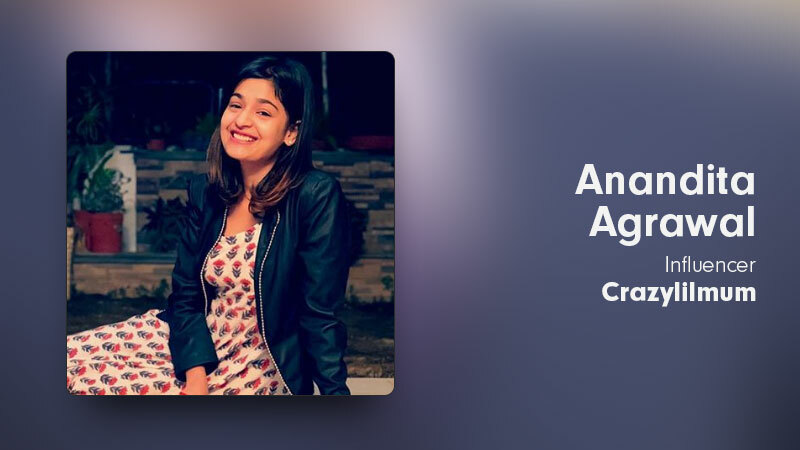 From keeping up with challenges, to the future she forsees for her brand, Agarwal shares some behind the scenes of crazylilmum. I always loved creating stories and getting photographed. I remember reading a fashion blog one night and didn’t even completely understand what it was. But, starting one of my own sounded like a good idea. And since I was a new mom, nothing could be a better niche for me than a mom blogger. I remember creating a blog on WordPress and writing down my first post. I used some pictures from my maternity shoot and my goodness! The response was mind blowing. I felt overwhelmed. Over the next few weeks, I started writing more about my pregnancy. I made sure to post a latest picture every day on Instagram. Before I knew, I had caught the Blogging and Instagram bug. . And with time, I could see an increase in traffic and followers. CRAZYLILMUM- I was only 25 when Shiv was born, did some crazy things and asked some no sense questions, so this name perfectly suited my personality. I think the USP would be the cuteness I try to add in all my posts. I have always tried to create a type of content that brings an instant smile on my reader’s face. What motivates you to get healthy? 💪 . . Honestly, long term goals don’t work in my case. So, when it comes to losing weight and getting healthier, I have some short term motivations that keeps me going. . . ▪️I always think about the amount of calories that will go inside me before eating everything. . ▪️I never weigh myself. I feel more motivated when I look myself in the mirror and when my clothing size goes down. . ▪️I am more comfortable to workout at home rather then at a professional gym. I do basic stretches at home for 20-30 minutes, or I just put Shiv to sleep, switch on the music and start dancing. (though I am not a very good dancer😆). . ▪️I feel really motivated when I see these Bollywood stars who are super fit. E.g. Deepika Padukone. I am like ‘Gosh I want to get fit like her’. I open some videos about their daily diet and workout routine, and try to work towards it from the next day itself. . ▪️Think like a Winner!- Post delivery, the only thing I was worried about was my weight. I gained 20 kgs but stayed positive and imagined myself being fit and healthy. I visualised myself wearing my old clothes and made my mind focused to do it. And here I am today, 2 kgs less than my pre pregnancy weight😇 . So guys, always remember that the key to happiness is having dreams, and the key to success is making dreams come true. Set your fitness goals today. Also, we have started a @letsbefitchallenge . The response has been amazing till now. Looking forward to have most of you on board. #letsbefitchallenge . . Wearing @tulibyvaunt . Please share your short term fitness goals that help you keep going! It’s very easy. Being a mother myself, I go through so many different challenges everyday. And that’s what I try to show people. Also, I learn a lot from my own experiences, research on the Internet and pen down the things that would help my readers. Since I have so many followers, many baby and mommy related brands approach me to promote their products. And that’s how I earn money. But yes, I am very particular about the brands I choose. They should be good quality products only. I try to be as genuine as possible. Also, it depends upon the category of brand. When people say that I inspire them, or they did something after reading my XYZ post. There was a brand who asked me to do a post for them, and in return they would repost the image on their page(with very few followers that too not organic). Can’t think of anything else right now, since I am very passionate about what I am doing right now. Every day is different in a mom’s life, just like a roller coaster ride. Quick, Quick, Quick! Put up good and engaging content, and please be organic. Numbers don’t matter, only engagement does. Larrisa- She gives those happy and positive vibes. One of the top and GENUINE influencers of the country.